It appears that Tesla owners have found another use for "autopilot" aside from just slamming into inanimate objects at high rates of speed: drunk, but eco-friendly, people drivers are also reportedly using it as a designated driver. 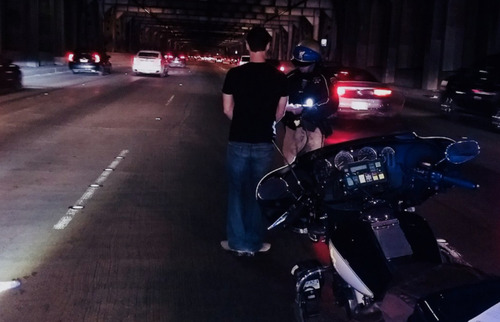 A report from ARS Technica recounts the story of a California Highway Patrol pulling over a Model S driver who "appeared to be asleep at the wheel." The vehicle was traveling on Highway 101 in Palo Alto and reportedly led police on a 7 mile excursion before they were able to get the driver's attention. "One of the officers basically ended up going in front of the vehicle and basically tried to slow it down," a CHP spokesman stated, and it took about seven minutes for an officer pursuing the vehicle to get it to pull over. The driver was subsequently arrested for driving under the influence. While the article notes that authorities can't yet confirm if the "Autopilot" system was turned on, it seems to be the obvious leading suspect in such a case. Then the question becomes: how could the "Autopilot" have been engaged if the driver's hands weren’t on the wheel? As ArsTechnica reminds us, Tesla recently released a software update that is supposed to warn drivers in as little as 30 seconds that the "Autopilot" will disengage if their hands aren’t placed on the wheel. If the driver was asleep, as suggested, the vehicle should have started slowing down. This situation echoes a similar incident that took place in January of this year when police found a man asleep behind the wheel of a Tesla on the San Francisco–Oakland Bay Bridge. After he was woken up, he insisted that he was fine because the vehicle was on "Autopilot", despite the fact that he was drunk by more than twice the legal limit. In the January case, the driver's car was found stopped. Obviously, that wasn't the case with the most recent arrest. That also leads us to ask: is it possible that not every single problem Tesla has is fixable with a software update? Who would have thought.